In a world where all cuisines are melting into one another to create culinary fusion and hybrids, Coyla keeps it familiar and sticks to authentic and hearty North Indian classics made with little drama but plenty of flavour. In a time of rainbow bagels and chocolate paan, authentic preparations and cuisines are beginning to hold a dear place in our hearts. Coyla, the new rooftop restaurant at Four Points by Sheraton understands this sentiment and offers classics just the way it should be done. With a menu full of our North Indian faves, like paneer tikka, tangdi kebab and pindi chole, the place keeps things very close to home, even sourcing their spices from Amritsar to maintain authentic flavours. 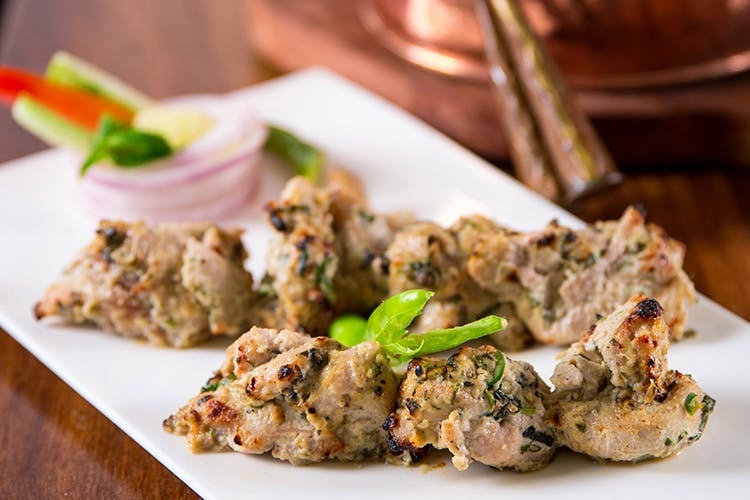 With plenty of starters to choose from including many kinds of kebabs, we recommend trying out the Baans Aur Singhade Ke Kebab, a kebab marinated in spiced buttermilk and then cooked in bamboo and the Tangdi Peshawari, another kebab that came stuffed with cheese and chilli. Vegetarians can munch on Paneer Tikka Angaree that tastes just like the tikka you get up north and the Kumbh Ki Galouti, a delicious mushroom kebab. For mains, we tried everything from Amritsari Pindi Chole, a nice and flavourful chole dish and a simple Kheema Matar, minced meat cooked with green peas to break the monotony. The Kumbh Hara Pyaaz was a mushroom dish with some spring onions tossed into the mix. But the star dish was undoubtedly the Gharwale Paneer, which was a rich and buttery paneer curry reminiscent of the ones that might be served at a dhaba up north. Pair it with their butter naan and a wave of nostalgia is sure to hit you. We wrapped things up gulab jamun and kulfi — a fitting end to this hearty feast. The ambience of the place adds plenty more charm to the whole experience at Coyla. A rooftop restaurant on the highest floor of Four Points by Sheraton in Whitefield, the place lets you enjoy the lovely Bangalore weather in an easy setting complete with potted plants around and a small stage for live music acts to serenade you through your meal here. A fine dining experience, prices are on the steeper end of the spectrum with a meal for two costing around INR 1,700. A little bit of peace and quiet in the otherwise maddening Whitefield, Coyla is definitely worth the trip if you’re in the mood for some good old desi khana.